Vocational Homemaker: If you're having a pillow fight, at least make it a clean fight. If you're having a pillow fight, at least make it a clean fight. 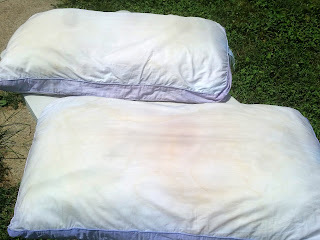 The condition of our bed pillows has been bothering me for a long time. We have a front loading washing machine, so they don't get "scrubbed" by agitation. To even get them in the machine they have to be bent, which means one side is way less exposed to water and detergent and never got clean enough for me. And don't even get me started on how long it takes to dry one of them, or how lumpy they are when they finally do get dry. Today I decided to solve this problem. Instead of one long cycle using a lot of detergent and bleach, I decided to try two, short cycle, with dishwashing powder and nothing else. First cycle - one side of the pillow out. Second cycle - the other side of the pillow out. And then, I put them on a table in the sunshine. Believe it or not, the pillow at the top of the picture is the "after" version. Imagine how bad it was before. I should enter it into the "Don't Judge" category at the state fair. ;) The pillow at the bottom has not been washed yet and is in the photo for comparison purposes. It is now in the machine going thru the second cycle. Pillow washer caveats: if yours is a feather pillow, do not use bleach or any product with bleach, as it will destroy the feathers. 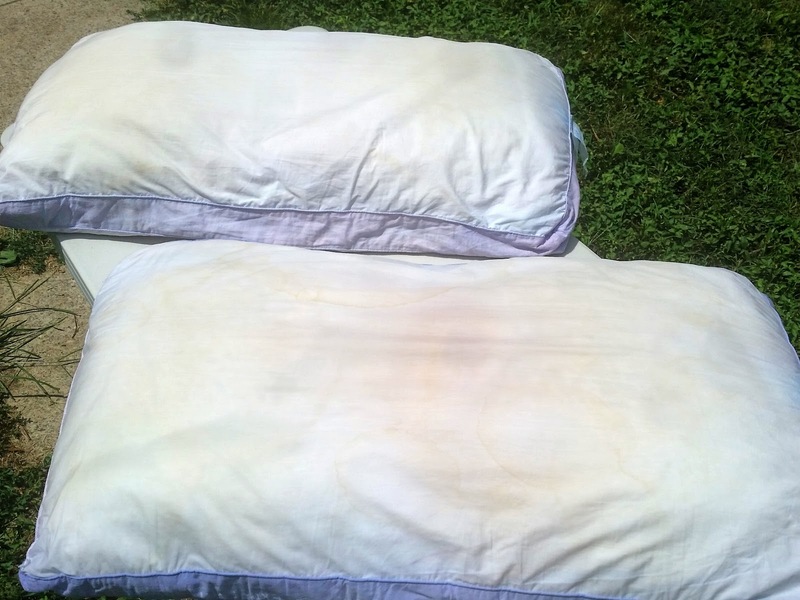 And if you have outdoor allergies and are in the allergy season, consider putting a pillow case on your pillows before drying them outside. You can remove the pillowcase before bringing them in and replace it with a clean pillowcase, then wash the outside one to remove allergens. Sunshine Bonus! Direct sunlight is a known bleaching agent and sanitizer/disinfectant. It's almost as good as bleach. And it is free. It even works in the winter, because it isn't the heat, it's the UV rays. There are all kinds of good links online for ways to clean your pillows. Many of them recommend combinations of ingredients that I do not think are useful, or that concern me in their combinations. When in doubt, don't cross the streams - one product at a time, and don't stand in front of your machine inhaling fumes.